Mountain West Reset: Will Stephen Zimmerman be the answer for UNLV? In the Mountain West, defending champions San Diego State and Boise State must bounce back from the loss of key contributors. With spring recruiting having closed and nearly every transfer player in place, SI.com is here to catch you up on the state of each conference heading into the summer. So far we’ve covered the AAC, ACC, A-10, Big East, Big 10 and Big 12. Now, the Mountain West. The Aztecs and Broncos shared the conference regular season title after both teams finished 14-4, though the Broncos were the top seed in the conference tournament by virtue of their season sweep of the Aztecs. 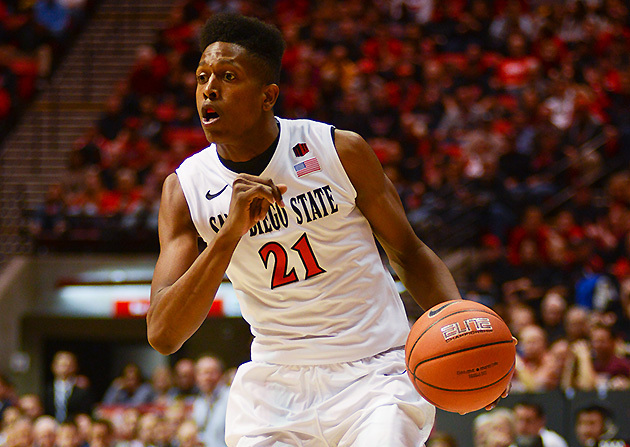 San Diego State leading scorer Winston Shepard is back for his senior season, but Aqeel Quinn and J.J. O’Brien graduated. That’s 21 points per game Steve Fisher’s squad will have to make up this year. The Aztecs added a pair of four-star recruits in shooting guard Jeremy Hemsley and power forward Brodricks Jones. The Broncos, meanwhile, are coming off their second trip to the NCAA tournament in three years, though both times they lost in the First Four. They’re going to have a tough time replacing point guard Derrick Marks, who led the team last year in scoring (19.3 points per game) assists (3.0 per game) and steals (1.8 per game). He and Igor Hadziomerovic were the only rotation players to leave, however, so Leon Rice’s team could be right back in the mix this season. Wyoming stole a bid to the NCAA tournament by winning the conference tournament. Larry Nance was the heart and soul of this team, and he’s now with the Los Angeles Lakers. In addition to Nance, Riley Grabau, Derek Cooke and Charles Hankerson, all of whom played at least 26 minutes per game last year, graduated. Josh Adams remains and will take on an even larger role in the offense, but the Cowboys could suffer some serious regression next season. The Runnin’ Rebels locked up Zimmerman, a five-star center, in mid-April, beating out UCLA and Arizona, among other suitors. He was the last player Dave Rice nabbed in recruiting, but he was also the most important. Zimmerman, a McDonald’s All-American who attended Bishop Gorman High School in Las Vegas, was the No. 9 overall player and No. 3 center, trailing only Diamond Stone (Maryland) and Skal Labissiere (Kentucky) in his class. Zimmerman is the sort of player who can shift the balance of power in the Mountain West eastward. At 7-foot, it’s not a surprise that he’s considered a top-level rim protector, but he can also lure his man away from the basket because he’s a threat on the perimeter. He also handles the ball well for any player, let alone for someone his size. The Runnin’ Rebels could have a very strong frontcourt, with Zimmerman and fellow freshman Derrick Jones joining Goodluck Okonoboh and Ben Carter, who transferred from Oregon. Zimmerman, however, will have to be the engine that makes everyone else go to help the team replace Rashad Vaughn, whom the Bucks drafted with pick No. 17 on Thursday. Zimmerman will have some growing to do, but he was a major get for UNLV. It cannot be overstated how much the Cowboys will miss Nance now that he’s off in the NBA. The forward led Wyoming with 16.1 points, 7.2 rebounds and 1.2 blocks per game. He had an offensive rating of 106.3 while using 28.2% of the team’s possessions. Thanks to Nance, the Cowboys put together a decent at-large résumé, going 11-7 in the Mountain West, including three combined wins over Boise State and Colorado State. Still, that wouldn’t have been enough to get the Cowboys in the NCAA tournament. So, Nance went out and carried the team to a conference tournament title, and Wyoming earned its first trip to the Big Dance since 2002. Nance increased his scoring average every year at Wyoming, and was also at the center of a defense that ranked 81st in adjusted defensive efficiency, making the team the fourth best defense, according to kenpom.com. Without Nance, the Cowboys are going to have a lot of trouble matching what they did last season. He wasn’t the only key member of their tournament team who graduated, but he was certainly the most important. Air Force: The Falcons had just one player, Max Yon, who averaged double figures last year, and he’s gone. Who fills that void? Boise State: If the Broncos are going to get back to the tournament—and actually make it beyond the First Four—they’ll need to find the leader of the post-Marcks era. Colorado State: One of the prime snubs from last year’s tournament, the Rams will have to figure out how to replace J.J. Avila, Stanton Kidd and Daniel Bejarano. ​Fresno State: The Bulldogs will need to find some shooters after ranking 296th in the country in three-point shooting percentage last season. Nevada: Can new coach Eric Musselman turn around a team that went 9-22 last year? Musselman, who coached both the Golden State Warriors and Sacramento Kings, was last a head coach with the Los Angeles D-Fenders of the D-League. New Mexico: The Lobos will need a full season out of junior guard Cullen Neal, who missed nearly all of last year with an ankle injury. ​San Jose State: The Spartans ranked 349th of 351 Division I teams on kenpom.com last season. They just need to figure out if they can beat a team D-I team this year. UNLV: The Runnin’ Rebels must learn how to reshape their offense now that Rashad Vaughn and Christian Wood no longer call Las Vegas home. Utah State: The Aggies had the 15th-best three-point percentage last year, but must figure out how to improve on one of the worst rebounding rates in the country. Wyoming: The Cowboys need to use the summer to find someone to help take up the reins left behind by Larry Nance.